Boxing legend Miguel Cotto’s ring return on August 26th against the ever-exciting Yoshihiro “El Maestrito” Kamegai will be shown exclusively live on BoxNation. 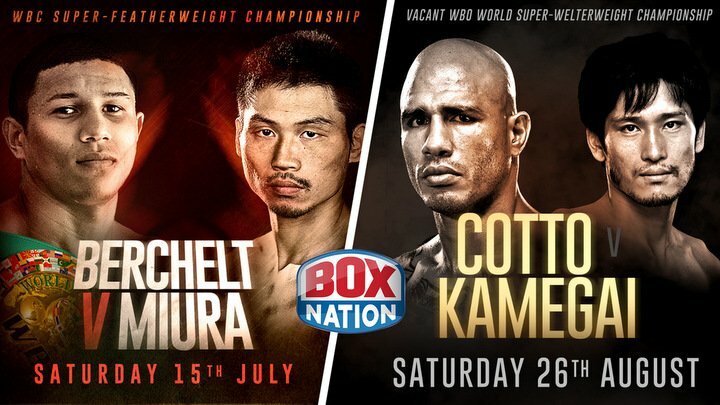 As part of ‘The Channel of Champions’ exclusive output deal with Golden Boy Promotions, BoxNation are pleased to announce the addition of Cotto-Kamegai, as well as a cracking card on July 15th with WBC super-featherweight world champion Miguel Berchelt headlining. Mexican Berchelt will make his first title defence against former champion Takashi Miura, with Bernard Hopkins’ conqueror Joe Smith returning to take on the Miami-based Sullivan Barrera in a heavy-handed slugfest. Both these fights cards are set to be all-action affairs, with Puerto Rican great Cotto’s bout to be for the vacant WBO super-welterweight world title and taking place at the StubHub Center in Carson, California. The only four-division world champion in the rich history of Puerto Rican boxing, Cotto will be out to show why he still has so much to give at the 154-pound weight class and will be looking to add Kamegai’s name to an outstanding list of opponents he has beaten. Kamegai is known as one of the highest-action fighters in the sport having engaged in a fight of the year candidate against Jesus Soto Karass in 2016 and taking champions and contenders including Robert Guerrero, Alfonso Gomez and Johan Perez into deep water. For his clash on July 15th at Los Angeles’ “Fabulous” Forum, Berchelt will be looking to keep his 10-fight consecutive knockout streak going following his impressive stoppage over Francisco Vargas in January, in which he claimed the 130-pound world title. Miura, one-half of the consensus 2015 Fight of the Year with Vargas, returns after a dynamic 12th-round stoppage against Miguel Roman.